Now I am no cook, and I’ve never pretended otherwise, but I do know that sometimes the best meals are made from left overs. You know, it’s a Monday and all you’ve got in the fridge is the remains of the Sunday roast chicken but by some cunning use of ginger, cloves, garlic, yoghurt, spices etc. and other ingredients you can turn it into a delicious leftover chicken curry. Well, this bike is our leftover chicken curry! Yep that’s right, it is the bits which were left over from some recent project bikes and were just sitting in storage. So what tasty morsels go into this particular recipe? 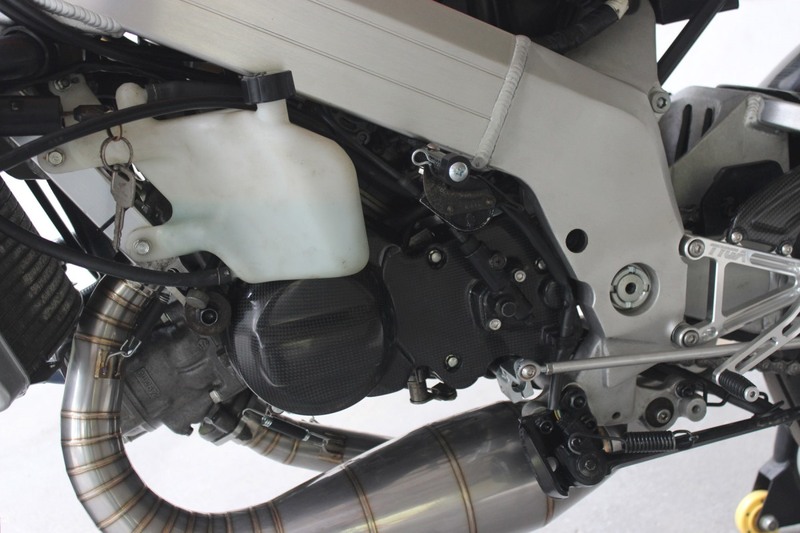 The ‘carcass’ consists of the MC21 test bike that we used to develop the Ohlins rear shock exclusively sold around the World by TYGA Performance. 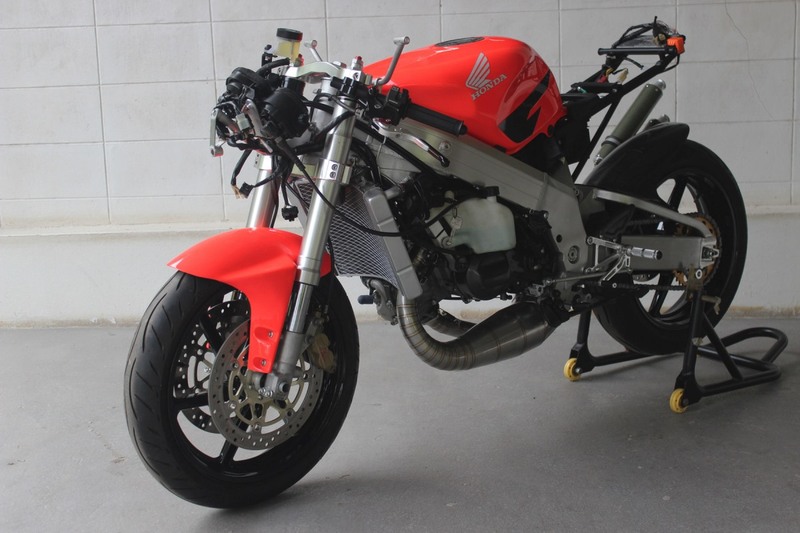 This started life as a lowly ‘R’ model with wet clutch aluminium wheels and the non-remote gas reservoir rear shock (which of course was removed for Ohlins testing) Anyway, on completion of suspension testing it had been put in storage and pretty much ignored for the last year. 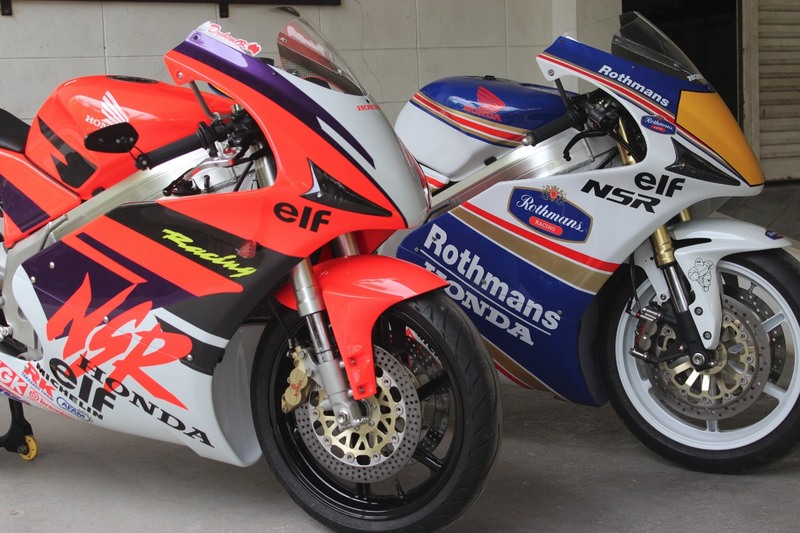 The next bowl of left overs came when we put the NSR300 Rothmans together. 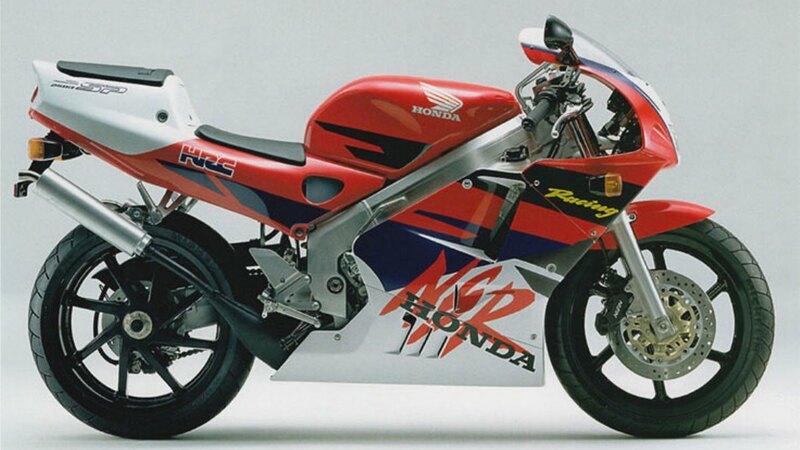 Previous, it had an NX5 RS250 front end and an old Ohlins rear shock from circa 1998. These were carefully wrapped up and kept in storage for just such an occasion. The final thing that triggered this dish was a GP-T bodywork kit which was getting painted in 1994 HRC colours to be used as an alternative for the Rothmans scheme. 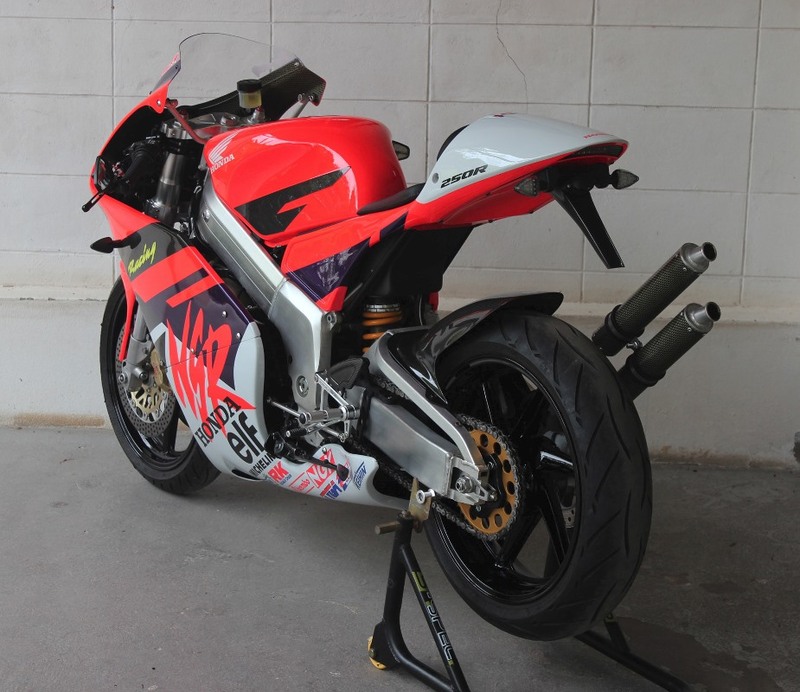 It was only when we used the Ohlins bike as jig to get the graphics properly aligned that I started thinking about a different plan to just having a change of clothes for the NSR300. One thing which was niggling was that the wheels needed to be black and not white so this would be troublesome if not expensive to have to swap back and forth wheels as wheel as body colour. I was also having second thoughts about wanting to do any changes at all to the 300 just because it was so well known (plastered all over the internet in June 2015) and was now becoming part of TYGA history. 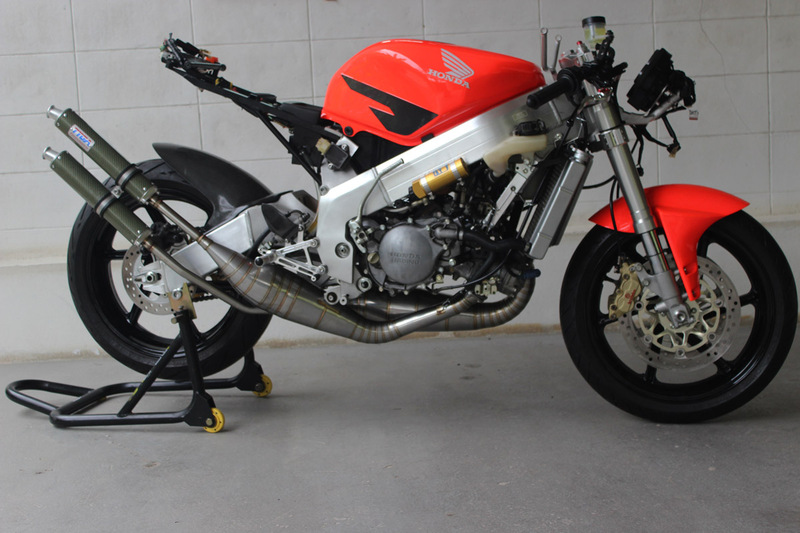 Anyway, when we put the bodywork on the Ohlins bike for the first sitting, they looked like they belonged there and as everyone who reads these project bikes can relate to, I am sure, you can never have too many bikes. 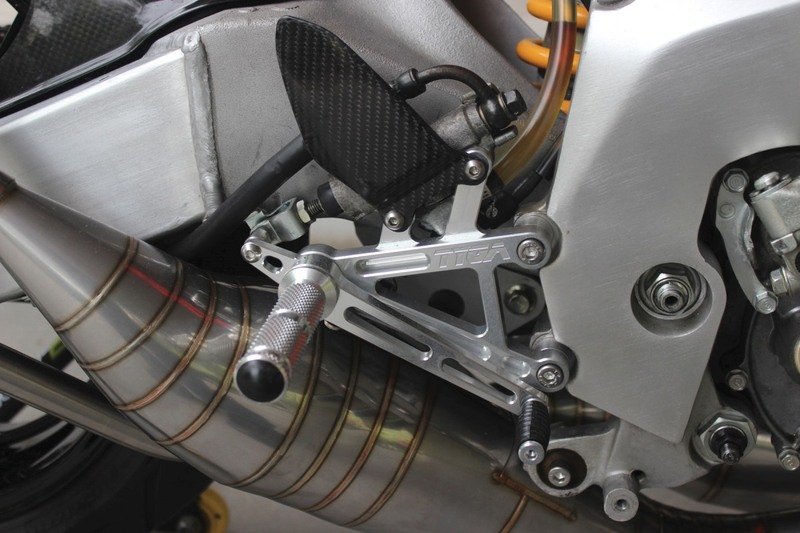 Now, the Ohlins bike might have looked quite neat and tidy doing laps with Matt hanging off in the corners, but up close, it had the scabbiest frame that I’ve ever seen on an MC21. The wheels were dinged and chipped and worse so they needed to go. 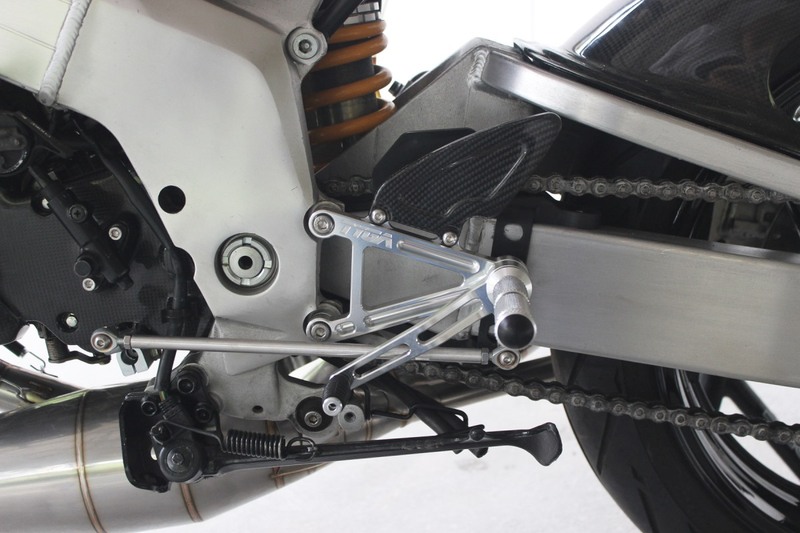 The swing arm was not great either, now that we are looking at it in a picky kind of way. Luckily we had more scraps in the larder, so to speak, and Matt produced a really clean frame and swing arm that had belonged to his 300 which had been scavenged for parts over the years, to the point that not much remained except for the chassis. Perfect! Next job was a total strip down. This took only a couple of hours once Matt saw what was going on and gave me a hand. 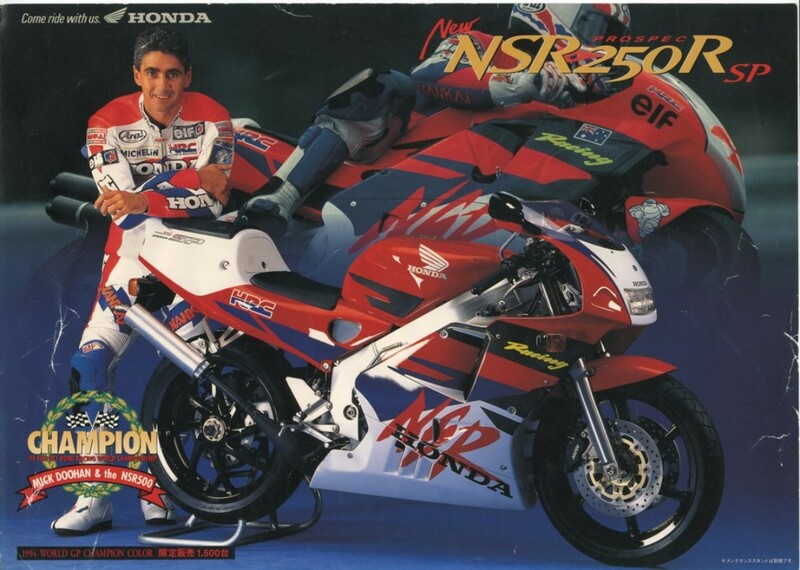 Just as well, as my memory is not as good as it once was, and I forgot a couple of obvious things even though I must have stripped down 40 or 50 NSR250s back in the day. Once the parts were spread across the floor, we could separate them out. All parts were inspected and bolts and brackets were prepared for zincing in their original colours of black, silver or gold. Other parts were separated into a pile for cleaning and painting, and another pile of parts which we wouldn’t need. The last pile was pretty big and included the wheels, the front end, all bodywork, tank and subframe. Now came the fun part, I spent an entire Saturday just trying to clean all the corrosion and staining off the engine. I am not sure if it was the right decision looking back. It might have been quicker to strip the engine down and blast the parts but anyway, it wasn’t supposed to be a major project just a leftovers bike, so the decision was taken to just clean it up a bit. My back was killing me the following Sunday (getting too old for this!) and I still hadn’t even began to clean the other parts. The good news was the frame off Matt’s bike was like new and the swing arm, although it had been stripped of the anodizing, was easy to freshen up with some light wet sanding and scotchbrite. 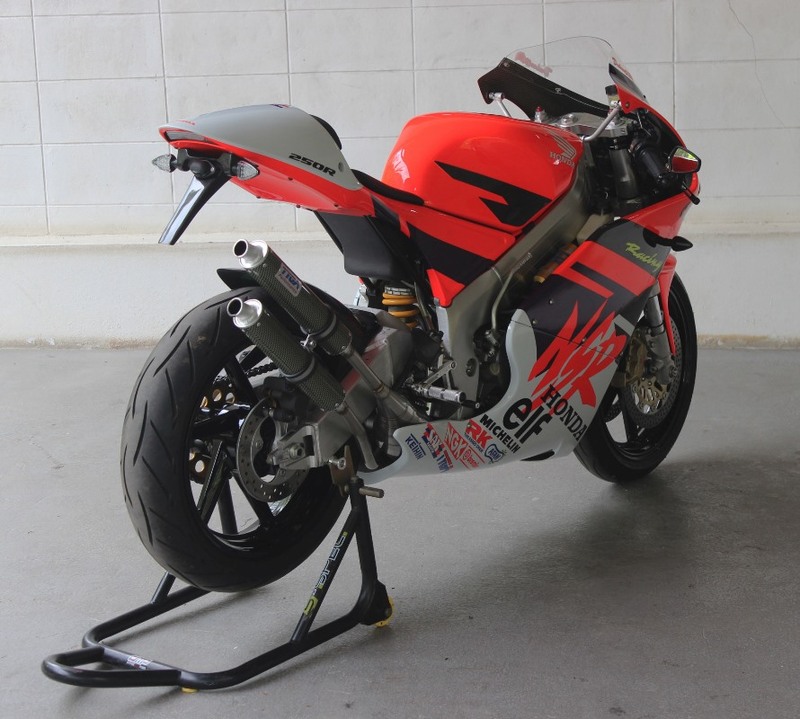 While the cleaning was going on, and the metal parts were being zinced, we sent a pair of stock MC21 wheels off to be painted black and dug out of storage a pair of tyres taken of the RC390. We also had a look around to see what else we could use and found a carbon hugger from the Rothmans MC21 which was surplus to requirements and substituted a few parts such as instruments, air-box, auto-lube container and some stays for better condition ones which we had squirreled away. Now came the fun bit; shopping on the TYGA website! Even with a leftover project, it is nice to add some choice components. 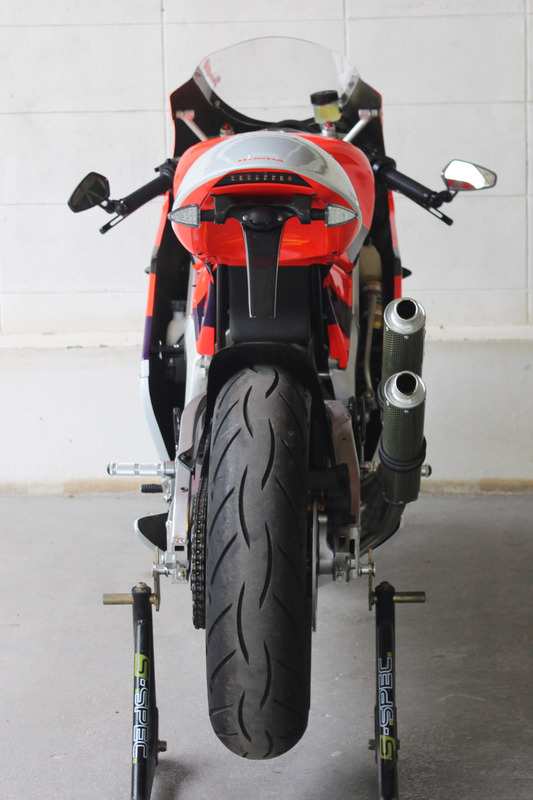 We replaced the TYGA step kit with the latest version, chose some GP two carbon/Kevlar silencers up the right side exhaust, 50 mm handle bars, a 40T TYGA rear sprocket, TYGA meter stay, LED indicators and some carbon parts such as the radiator shrouds, front brake reservoir stay, fuel tank filler cap and instrument rings. 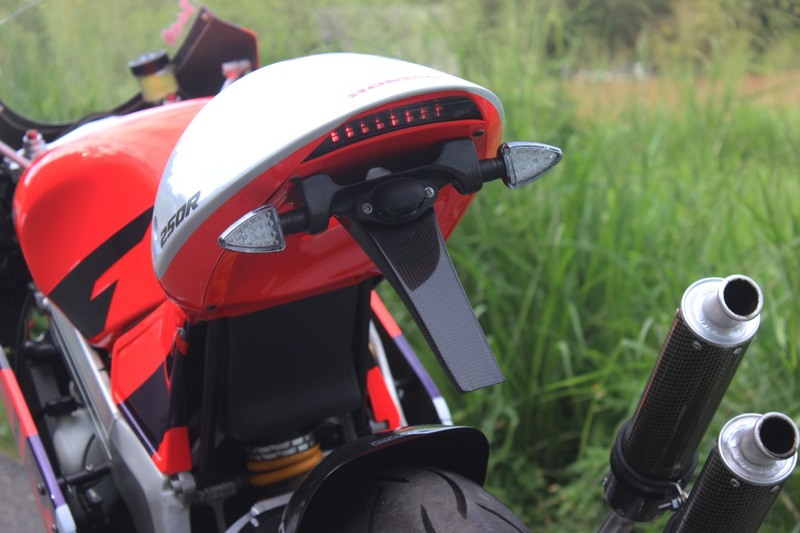 We also went shopping at Honda and bought a new front brake reservoir, hand grips, chain rubber (yes now back in production so that is good news!) and a few fasteners which were non stock. After cleaning, the radiator, side stand clutch and brake perch, along with a few other bits and pieces, were painted to make them look like new. Matt rebuilt the front forks which had been leaking and while he was at it, fitted newly anodized adjusters to freshen up their appearance. 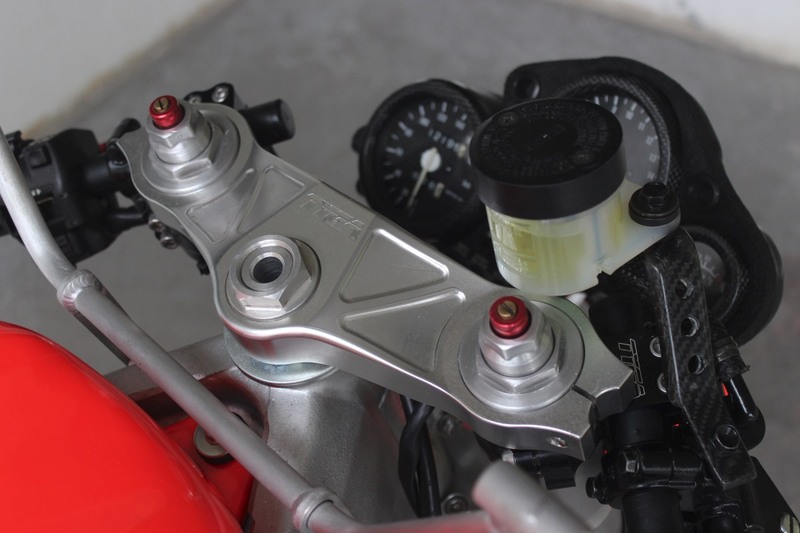 Once installed, he made custom brake lines to link the Brembo calipers to the stock Nissin 14 mm master cylinder. 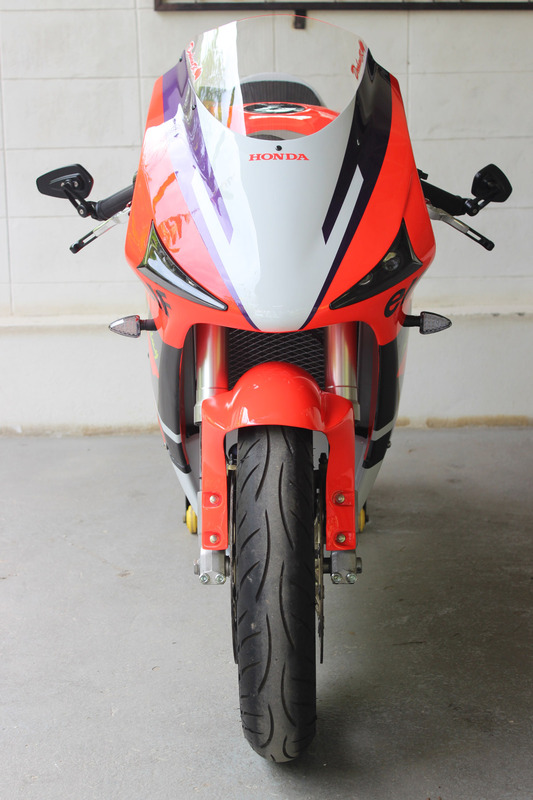 The original plan was to use VTR1000 Firestorm rotors but the ones we had tucked away were pretty badly warped. 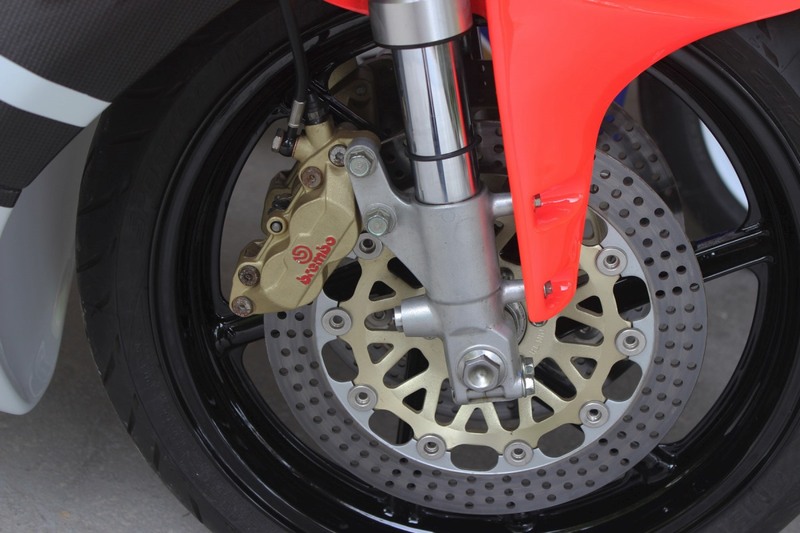 Not a big deal, we had some spare RS250 ones which perfectly compliment the calipers and pads. The rear suspension, as previously mentioned was taken care of with the used Ohlins rear shock. 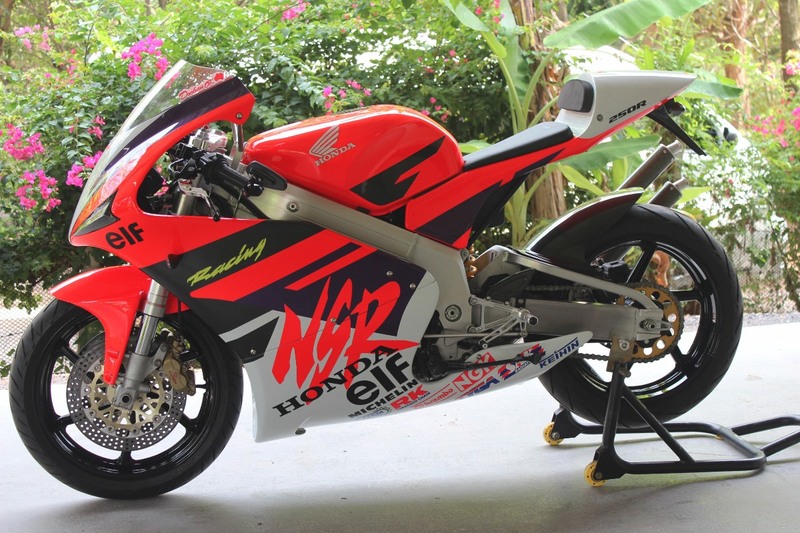 We resisted the temptation to put a Brembo on the back and had to stay disciplined to the idea that we were using up what we had, not trying to make the ultimate NSR. 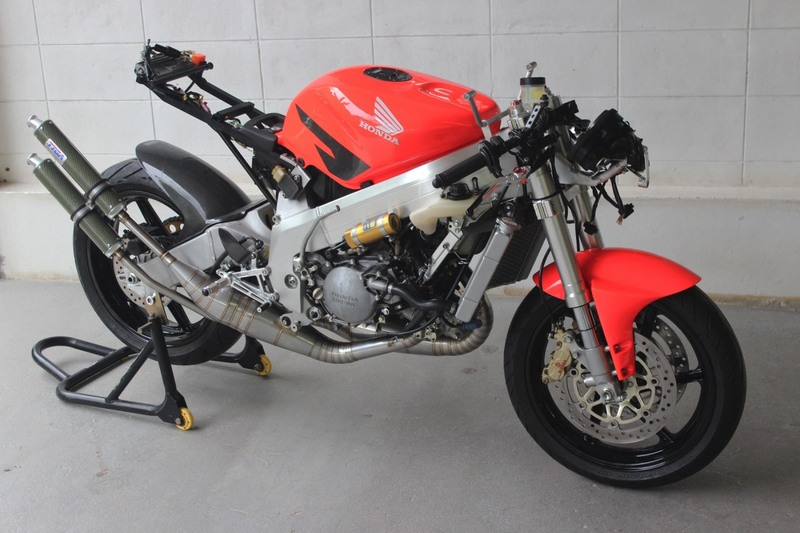 It is too easy to get carried away and install RS250 magnesium wheels, a 300 motor and this and that but we had to keep the budget down. After waiting a couple of weeks for the zinc parts to come back, the chassis went together very well. We had the engine soaked in WD40 during this period and this helped to lift the corrosion that I hadn’t managed to remove with scotchbrite and brass brushes. We replaced all the nuts and bolts on the engine with either ones we had re-zinced or new Honda ones. These shiny parts helped to freshen up the engine, and along with the scotchbrite work and the WD40, it was transformed to an object of technological 2 stroke beauty and was now ready to be installed in the frame. 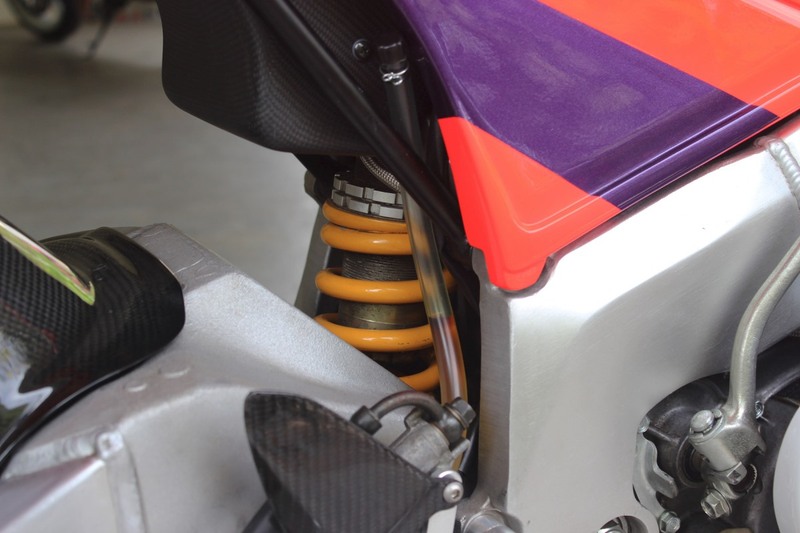 Matt had some NSR250 F3 engine rubbers which we used instead of the worn stock ones. All went well with the build, and so it should because this stage in the procedure was more or less stock. 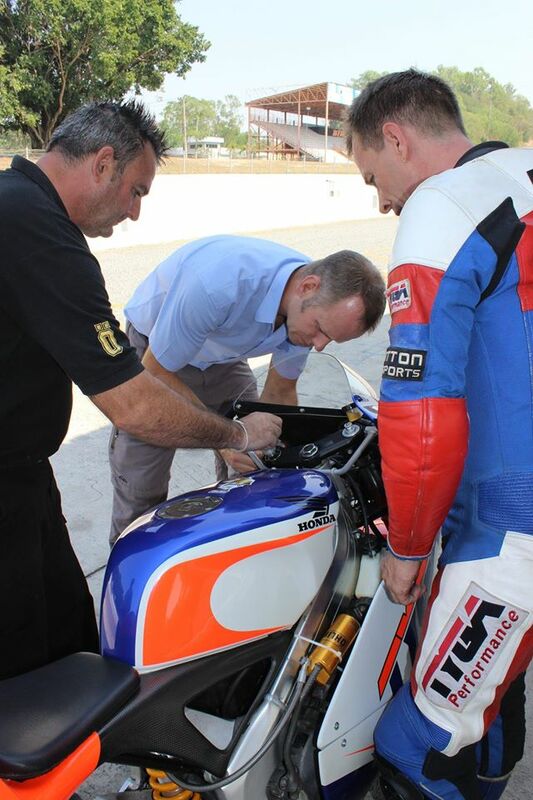 The issue we had with the chassis was with the Ohlins rear shock and the GP-T bodywork. Either works fine by itself but when you put them together, the hose, where the banjo bolt is, clashes with the battery box part of the subframe. One choice would have been to turn the shock round but then have issues with the banjo bolt and air box clashing. We therefore decided to cut a section out of the battery box to allow the subframe/battery box to fit and lay the gel battery on its side on a foam block above where the banjo bolt was; problem solved! We also had to trim the front section of the undertray for clearance with the shock hose too but that was pretty simple. The wiring and other components were installed without drama and it now came the important and exciting moment to fire the NSR back to life! 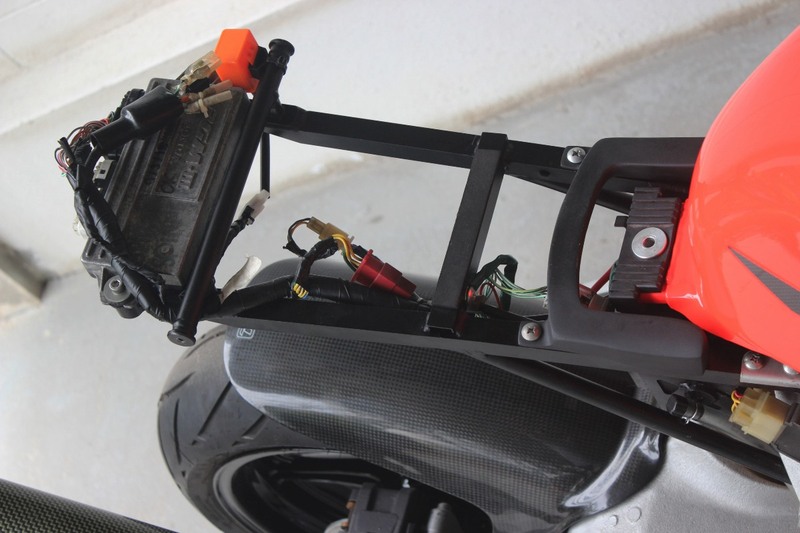 Normally, with these builds, if the bike is mostly getting a cosmetic makeover, it should start right up the same as it did previous to dismantling. I say normally, because every now and then you get a stubborn bike which refuses to start and this was the case with our MC21. We quickly discovered that we didn’t have a spark on either plug but why this was the case was not so easy to discover. After hours of running through the electrical system (I was feeling guilty because I had re taped up the harness and was worried I had broken something), it turned out to be two things, a defective pick up and dodgy connection in the connector coming off the pickups. Once these were replaced, it fired into life right away and we were now ready to move to the next step. Matt used his rather trick “ignition simulator” to set up the RC valves. It replicates the NSR250 flywheel and he uses it for running bench tests on PGM’s and other NSR related electrical components. 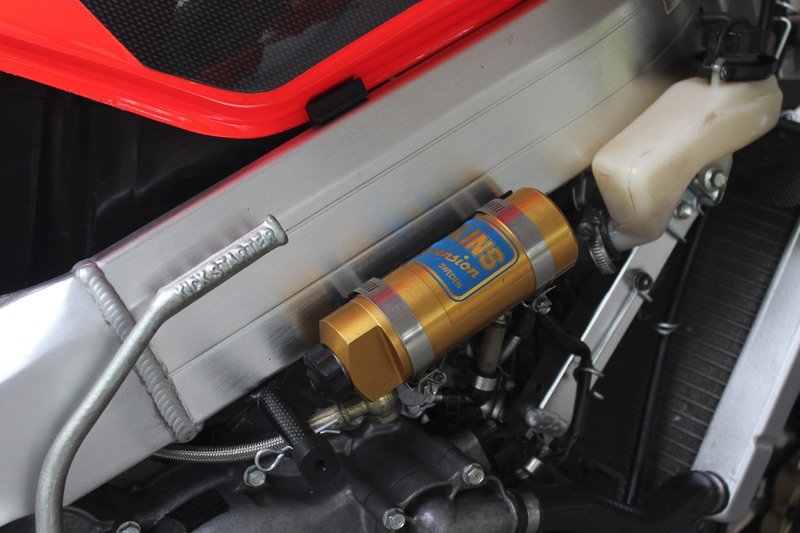 It can run the ignition system without actually firing up the engine so enables a complete test of the electrical system without the noise and 2T smoke pollution. Due to the ignition issue taking so long to resolve we ran out of time to complete the build and the rest would have to wait until later in the week. The delay did have one positive effect. We had ordered up a remote ignition switch off the Internet and it arrived last week so Matt got to work and used the stock connector for the ignition switch to connect it all up. 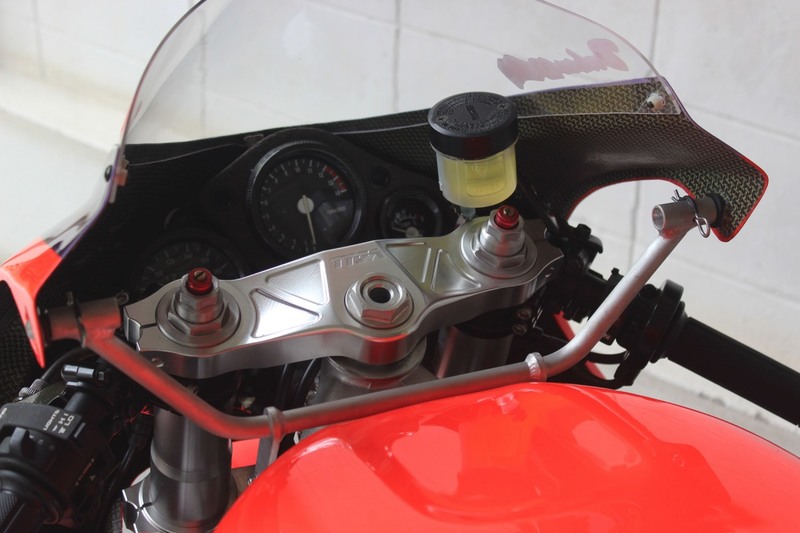 The beauty of this system, apart from being trick and a talking point, is it allows you discard the weight and bulk of the ignition switch which had no home on the RS250/NSR250 triple clamp. 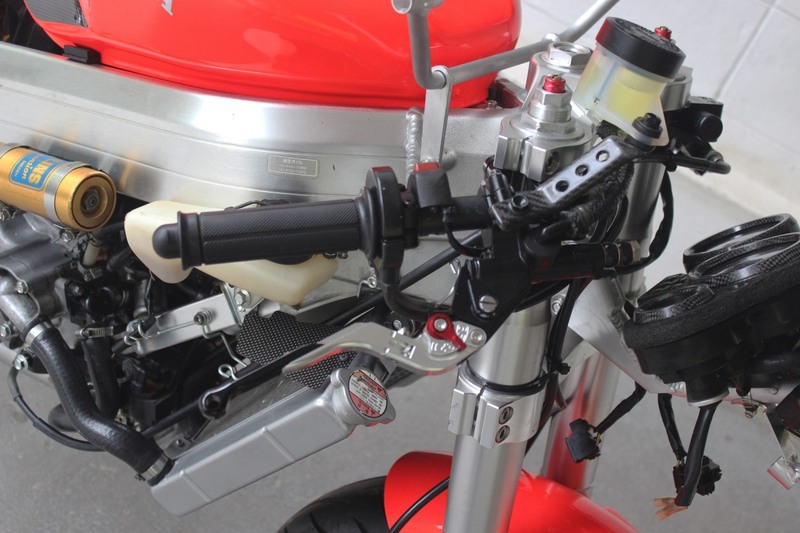 Of course you lose the steering lock feature but ours didn’t have that anyway due to the special triples; so it was a no brainer and highly recommended for such builds. 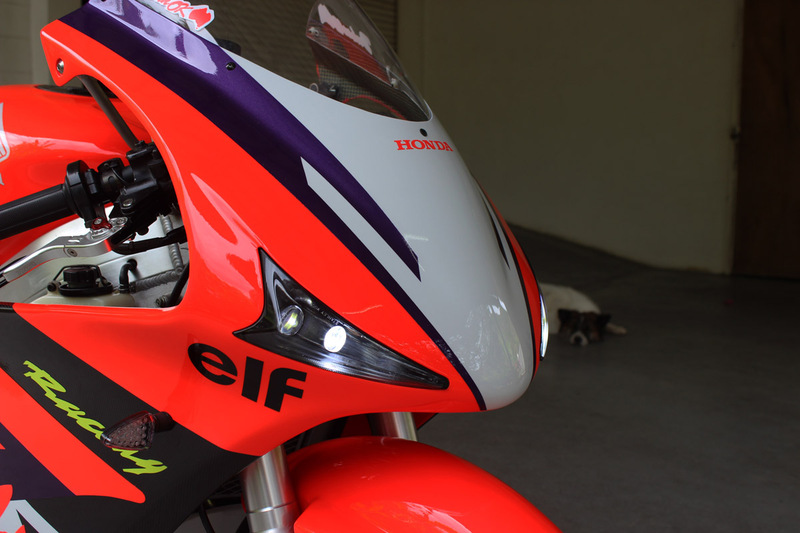 Now, I am sure looking at the pictures, you have noticed the fabulous paintwork that Khun Pong our painter has done on the GP-T bodywork. 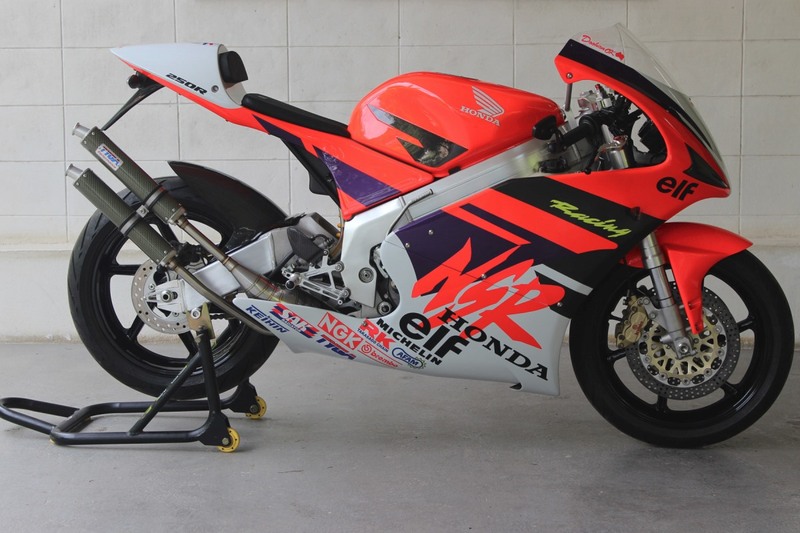 The scheme is strongly based on Doohan’s 1994 NSR500 which he raced late in the season. 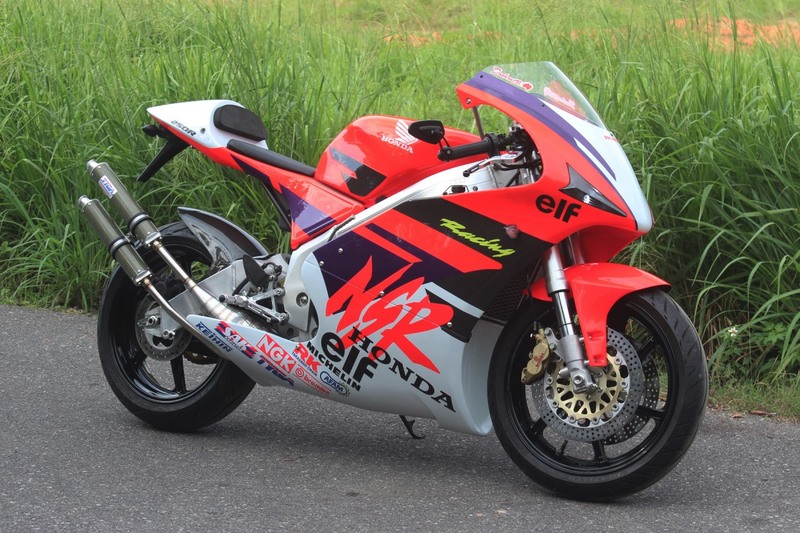 A similar scheme was also used on the factory NSR250s in 1995 and Honda brought out a watered down version for their production MC28 in 1995. 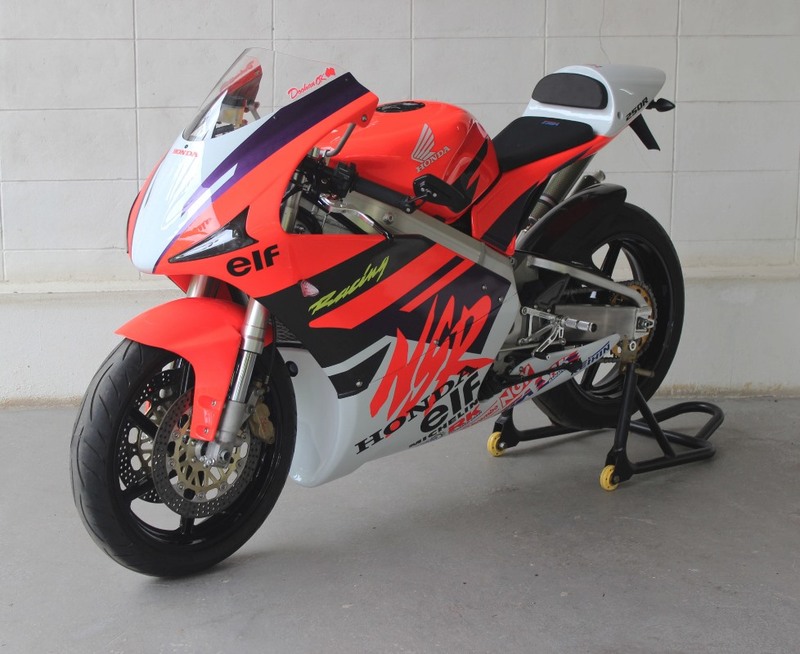 Now for anyone who has been to the Motegi museum or seen one of these factory bikes close up, the scheme just jumps out at you and is, I am sorry to say to 1995 MC28 SP owners out there, much brighter and striking than the production bike’s solid red. We were determined to use the correct colour, and in the end, even Khun Pong is saying, are you sure you want it sprayed that bright and I am saying, yes, just the same as poured out the can. He thinks the police will pull us over as it stands out so much LOL, and he is suggesting adding some solid red to tone it down and I’m holding out and firm with him, fluorescent orange red as the can is the colour we want! As a final argument, he is saying it will fade if you park it in the sun and I’m telling him I won’t do that. 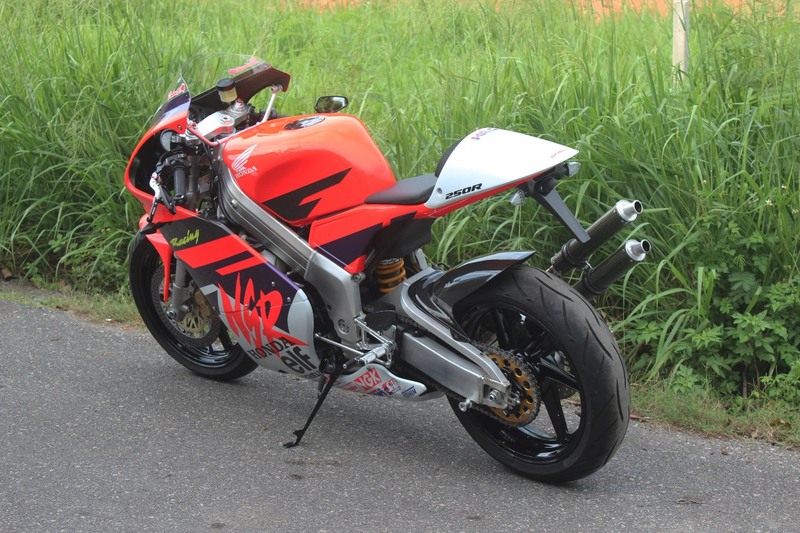 ( I was remembering the bright orange 1199 Superleggera that was fading in the car park at the Buriram Circuit when we were up there recently. That owner must have been really annoyed with himself for leaving it there in the UV, but I digress). 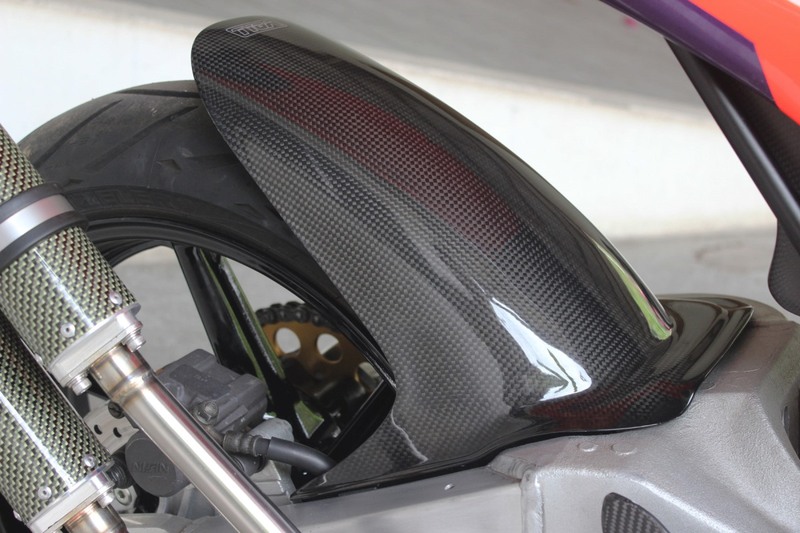 To contrast with this orange/red as the main colour, we left the carbon exposed on the fairing and Khun Pong managed to glue some thin carbon sheets on to the sides of the fuel tank to have real carbon there to match the fairing. 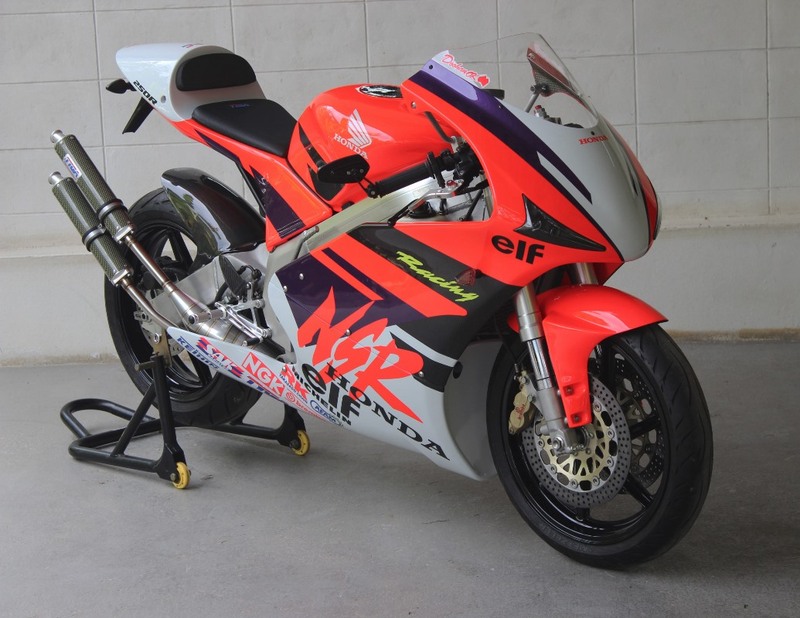 He tried to have the graphics cut in suitable vinyl but couldn’t find anything to match the orange/red so ended up painting the big NSR logos on the sides to be 100% sure to get a perfect match. He is a perfectionist and just as well because we are pretty fussy too! 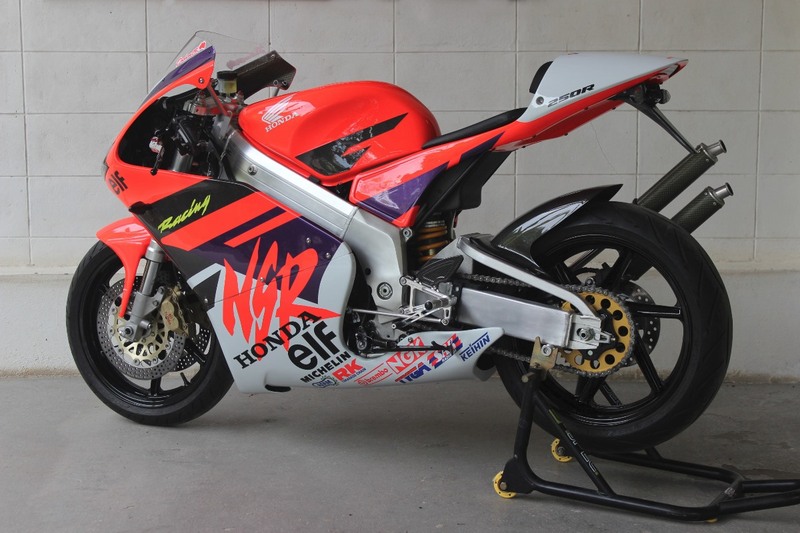 We decided to add the sub sponsor decals on the lower fairing but refrained from Doohan’s number 4s that he raced with in 1994. 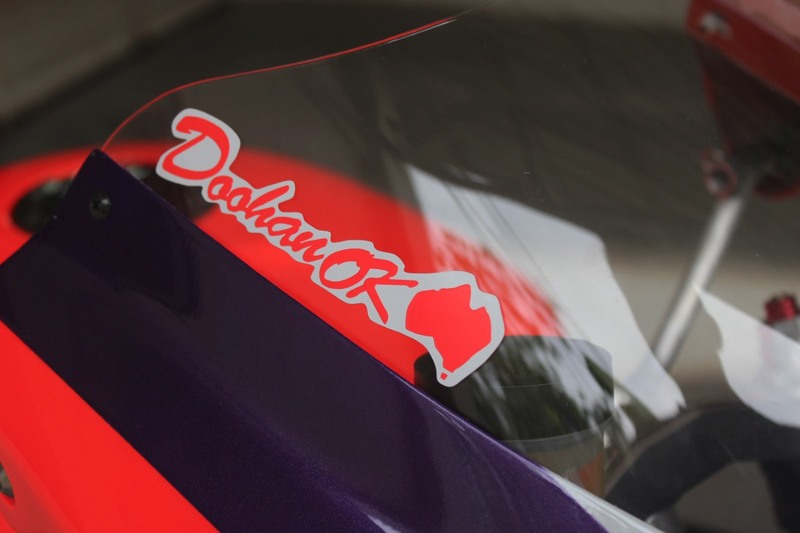 We did put the ‘Doohan Ok’ stickers on the windscreen and I’m still undecided if it should have the Australian flags on the sides where the ‘Racing’ graphics are. I suppose it should have them but I don’t want to make it look too cluttered. 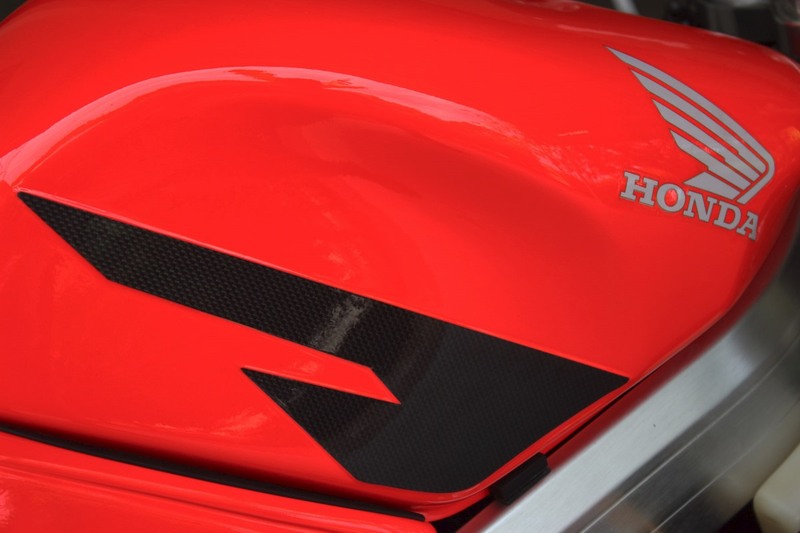 We added a couple of Honda logos front and rear and 250R on the seat cowling sides to help give a clue to the identity of this bike’s modest origins. 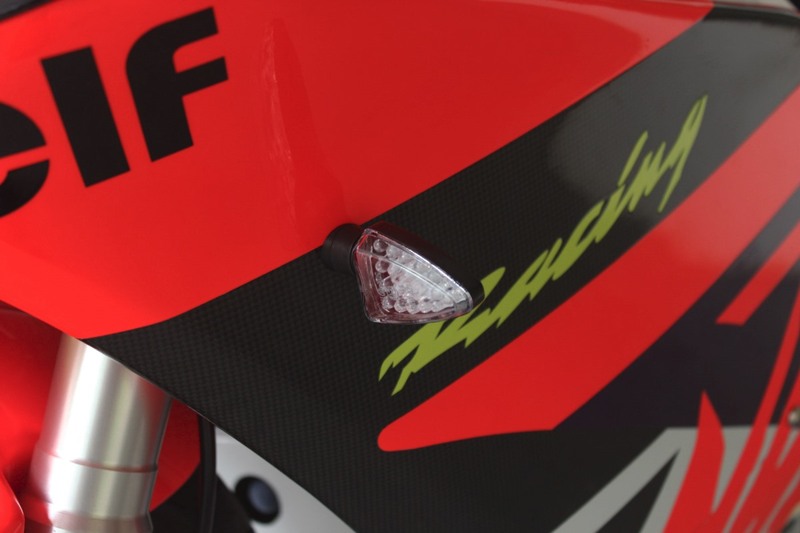 With practical aspects such as mini indicators and bar end mirrors, you can definitely say this a tribute bike and we are not going for the full on ‘replica’. 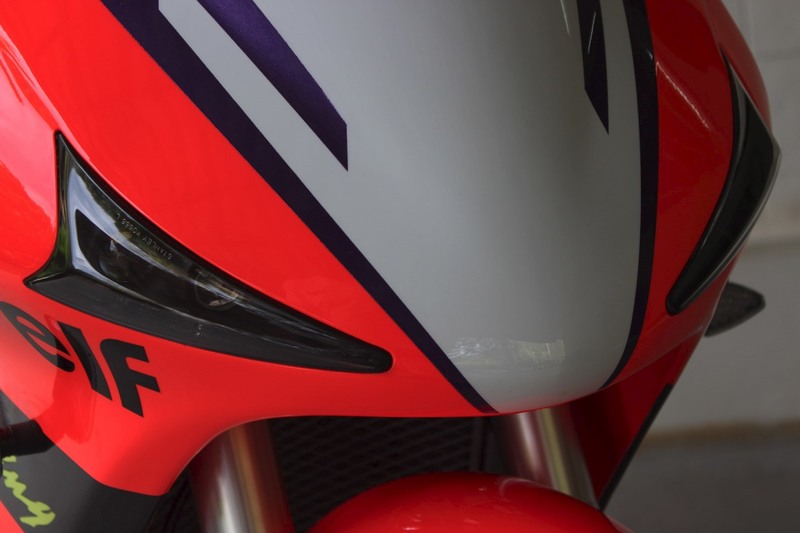 It is, in the broadest interpretation, a road legal motorcycle which is quite remarkable because at first glance it screams at you that this bike belongs on circuit. So now that it is all together, it is time to ride this bike made of scraps. 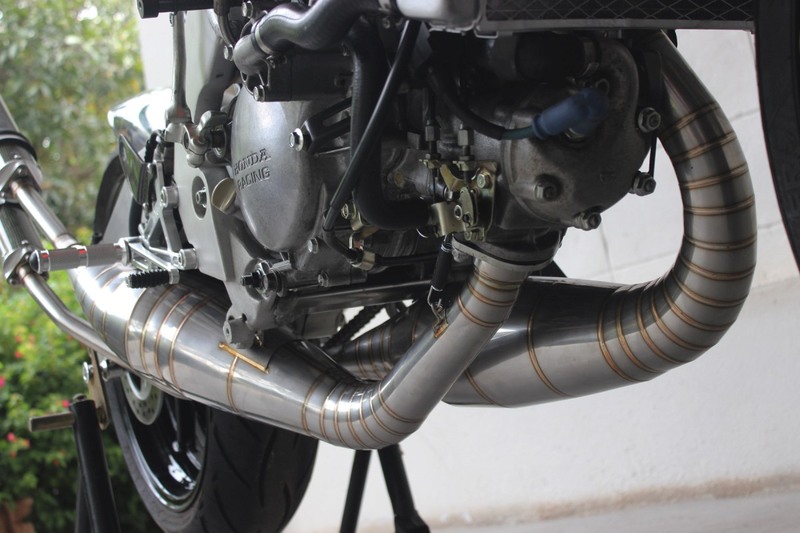 Will it feel like a cobbled together pipe of rubbish or will it ride like it looks, namely a brand new serious sports bike? Jumping in the saddle, the first impression is a confusion or should that be fusion of the old and new. 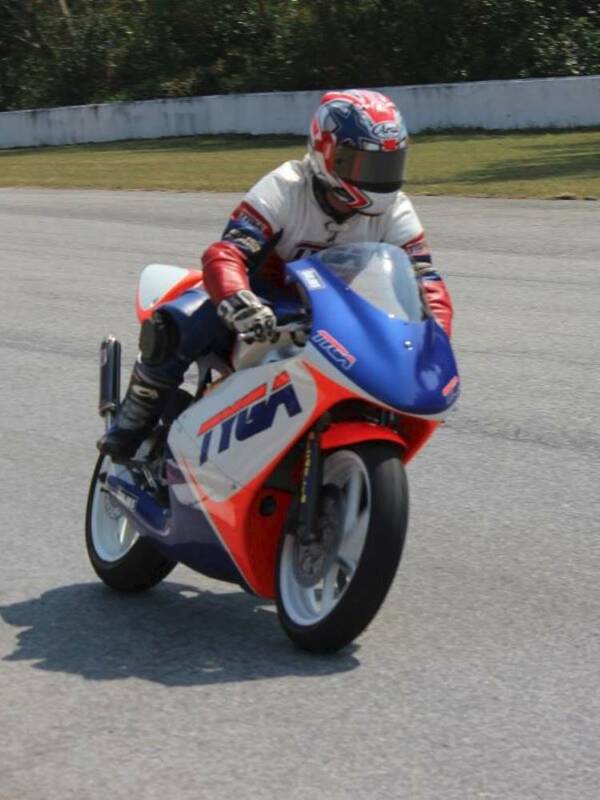 The riding position is very sporty with the high and minimal seat and not at all 1990s. The bike feels small but there is plenty of space even for someone almost 6 foot tall like me. 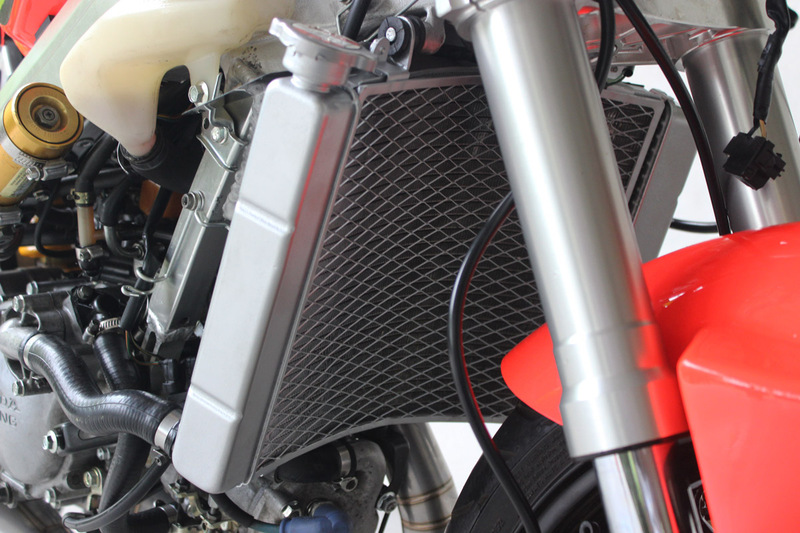 Looking ahead you have the bright red fuel tank which is almost dazzling and contrasts with the exquisitely 3D machined silver triple clamp and upside down forks. 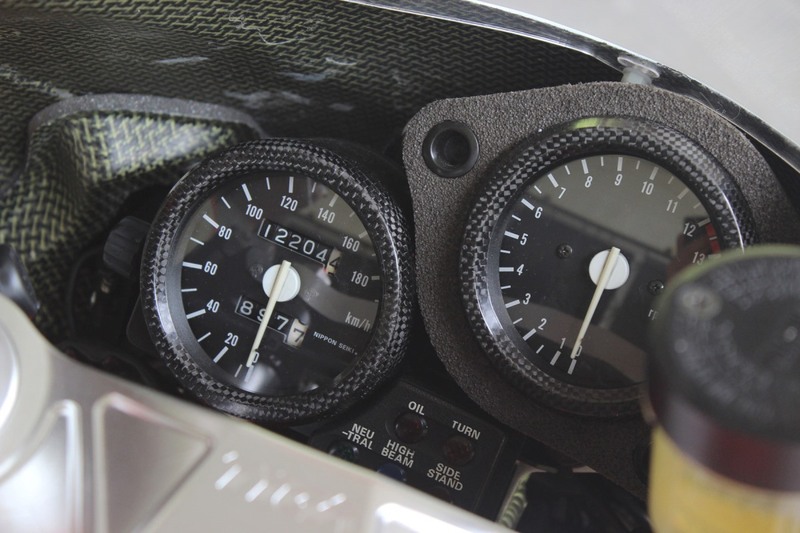 But beyond that you have these three round carbon framed instruments with their archaic but practical analogue dials staring out from the carbon/Kevlar fairing. We are a fan of these, mainly because you can see at a glance where the needle is. No need to read any numbers! The remote ignition device is all very effortless to get the dials and trick quadruple LED headlights glowing with a simple press of a button but you still need to physically swing out the kick starter to fire the engine into life. The first thing which I was expecting but wasn’t absent, was the clanking of the dry clutch. Oh yes, this is a wet clutch motor and as such there is none of that self- conscious, trying not to look around, as everyone stares at your bike expecting your engine to explode. 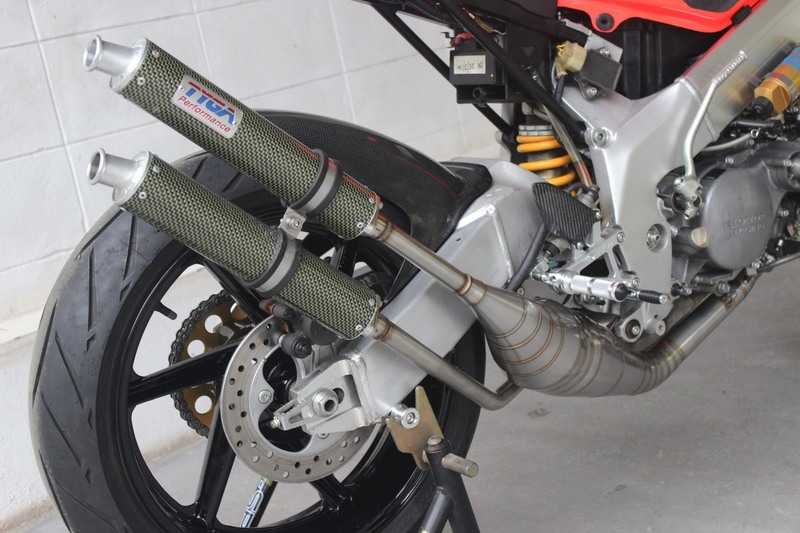 which is what you get used if you ride a two stroke with a dry clutch. No, this is very civilized and conventional but that is where any similarity between this and the modern so called light weight ‘sports’ bikes ends. 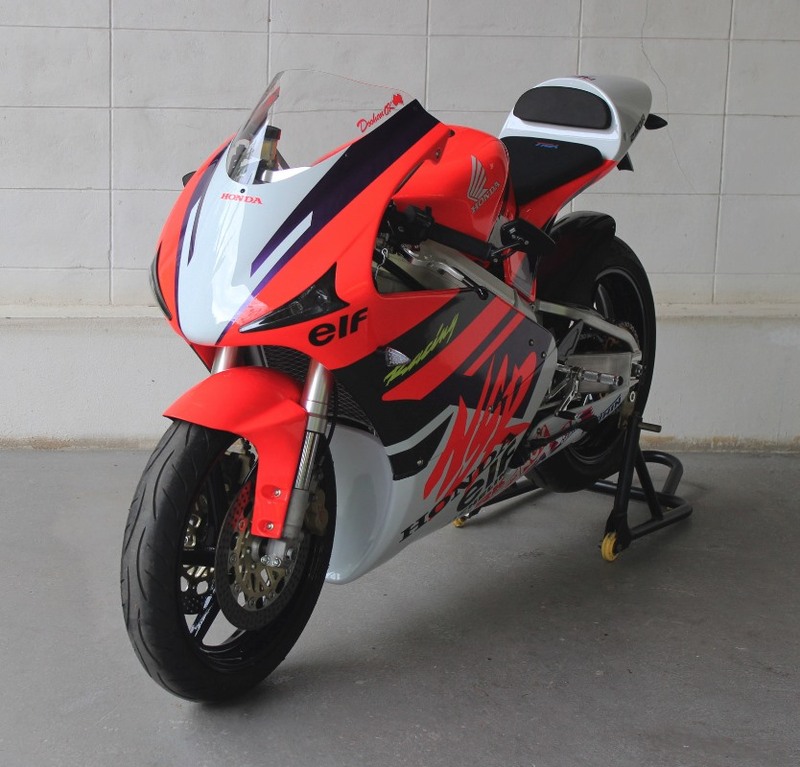 The NSR takes a while to get warmed up and is fluffy off idle in the lane from the factory and so very first impressions are not favourable compared to say a Ninja300 or R3. On the plus side, the impression is that it tips in very easily on the stock size tyres and feels light and nimble if not a little hard edged. 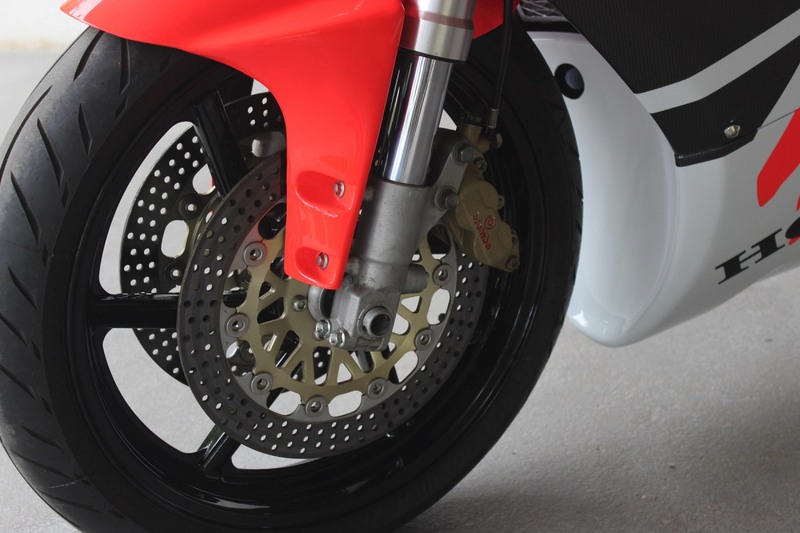 The brakes have loads of feel and require only one finger to get the pads making satisfying ‘shishing’ noise on the discs. Once out on the open road and it is time to open the throttle. Remembering this is only a 250, it accelerates hard to the redline on that old fashioned rev counter in the first four gears. By this time you are going too fast and time to apply those Brembos again and they bring the bike easily to a stop at the U turn. 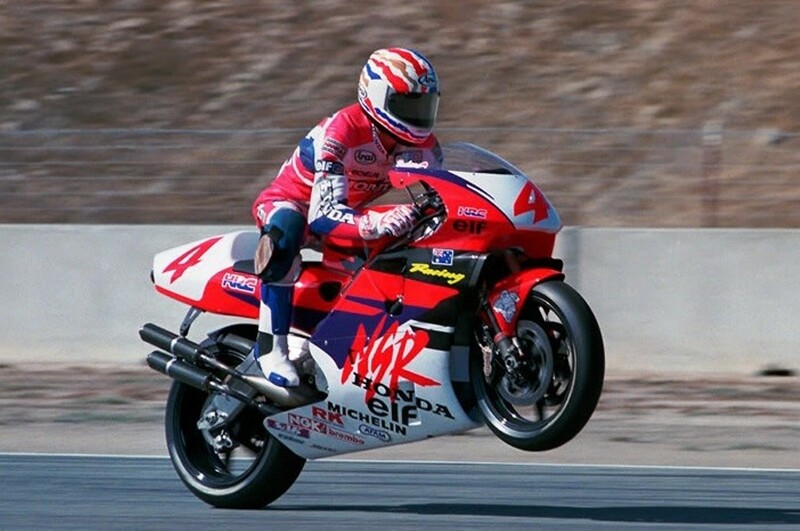 Apparently, moving off from a standing start, with a bit of persuasion and change of body weight to further back on the seat, the Doohan wheelies on the power in first and once up on the rear hoop, can be kept there for a considerable distance. Of course this is only done on private closed roads and I only know this because Matt told me (wasn’t me officer! – Matt. )… Anyway, for us, normal, license loving folk, the bike feels tight, and easy to control and does whatever you command of it. The only negative is the fluffiness off tickover which is not a big deal and hopefully, easily resolved with a bit of carb work. In any case, if you want to ride a bike which chugs around on tickover, then get yourself a Harley! 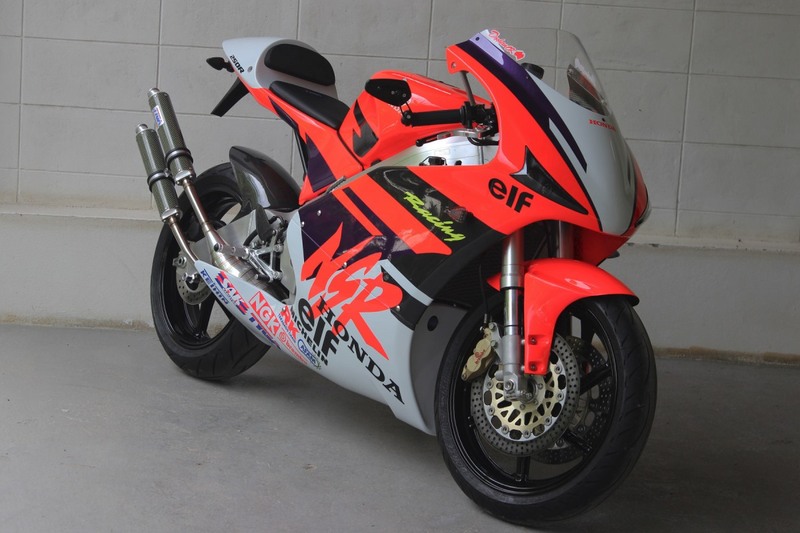 This two stroke is designed to be revved and the satisfaction comes with every perfect gear change keeping it on song. We couldn’t really take the NSR to the limit on public roads so the next test will be a session at the circuit and we can explore more of the handling and hopefully make some videos, so watch this space. So, does this bike live up to expectations? Well, as a relatively straight forward, quick and easy thing made from bits we had sitting around, it definitely makes sense . The recipe was easy and fun to prepare and the resulting dish made from leftovers is delicious!